9789041154439, titled "Export Control Law and Regulations Handbook: A Practical Guide to Military and Dual-Use Goods Trade Restrictions and Compliance" | 3 edition (Kluwer Law Intl, May 31, 2016), cover price $216.00 | About this edition: Global Trade Law Series Volume 33 Export Control Law and Regulations Handbook provides a practical overview of the export/import control regimes covering defence and dual-use goods and services in fourteen key jurisdictions in addition to chapters on the international regime in general. 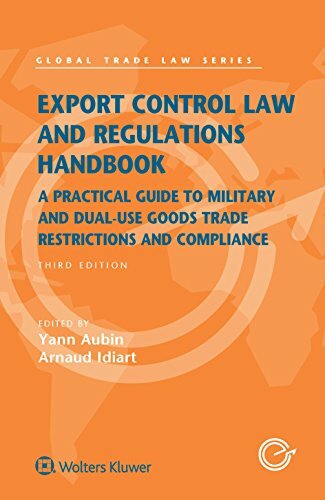 9789041135292, titled "Export Control Law and Regulations Handbook: A Practical Guide to Military and Dual-Use Goods Trade Restrictions and Compliance" | 2 pck har/ edition (Kluwer Law Intl, June 30, 2011), cover price $203.00 | About this edition: Export control laws and regulations are the legal framework for countries around the globe to ensure world peace and stability and their importance in international trade is growing. 9789041126016 | Hardcover with CD edition (Kluwer Law Intl, March 15, 2007), cover price $212.00 | About this edition: Export control laws and regulations are the legal framework for countries around the globe to ensure world peace and stability and their importance in international trade is growing.